MF Audio, founded in 1998 and based in the North of Paris, is a full service live event production company providing sound, lighting, and staging solutions. The principal, Sebastian (Seb) Fleury has made a point to surround himself with accomplished production professionals, which has led to the success of the live event production company. One of the other secrets to its success has been to ensure that all products in their inventory meet their four qualifications – quality, reliability, usability and versatility. Recently, MF Audio invested in a new Adamson System Energia E15 PA, which meets their four qualifications in spades. As a long-time supporter of Adamson – with previous investments in Spek-Trix, Y10, Y18 and Metrix – it was a likely pairing that has suited everyone extremely well. "We were looking for a line array system that would allow us to expand our PA offerings as business has grown," explains Fleury. "Our goal is to always be at the edge of technology and provide ever more efficient solutions that combine innovation and performance. Purchasing the Adamson E15 system helps us achieve our goals." The original investment consists of 18 E15 enclosures powered by Lab.gruppen PLM20000Q amplifiers with LAKE signal processing and digital audio transport via Dante. MF Audio christened the new PA on the main stage floating on the lake of Enghien Les Bains. The system was also used in support of France distributor DV2 at Champs de Mars on July 14. "With the E15, we sounded better than anyone else," Fleury concludes. "The system is lightweight and easy to rig, amazingly consistent and has headroom that doesn't quit. 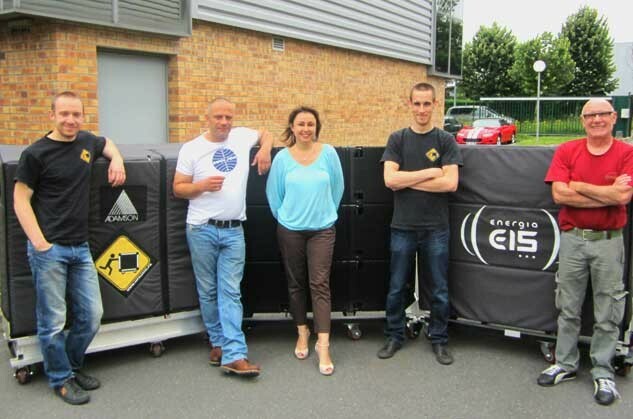 We are delighted and eagerly await the arrival of the new E12 line array so we can check that out as well." In picture: the MF Audio Team of Michael Olivier, Sebastien Fluery, Marga Lopez, Gregoire Olivier and Jaco Iron.